The microenvironment of human follicular lymphoma (FL), an incurable B cell non-Hodgkin’s lymphoma, is thought to play a major role in its pathogenesis and course. Microenvironmental cells of likely importance include follicular Th cells (TFH) and regulatory T cells (Tregs), and understanding their interactions with FL tumor cells is necessary to develop novel therapeutic strategies. We found that IL-4 and CD40L are expressed by intratumoral TFH and induce production of CCL17 and CCL22 by FL tumor cells. 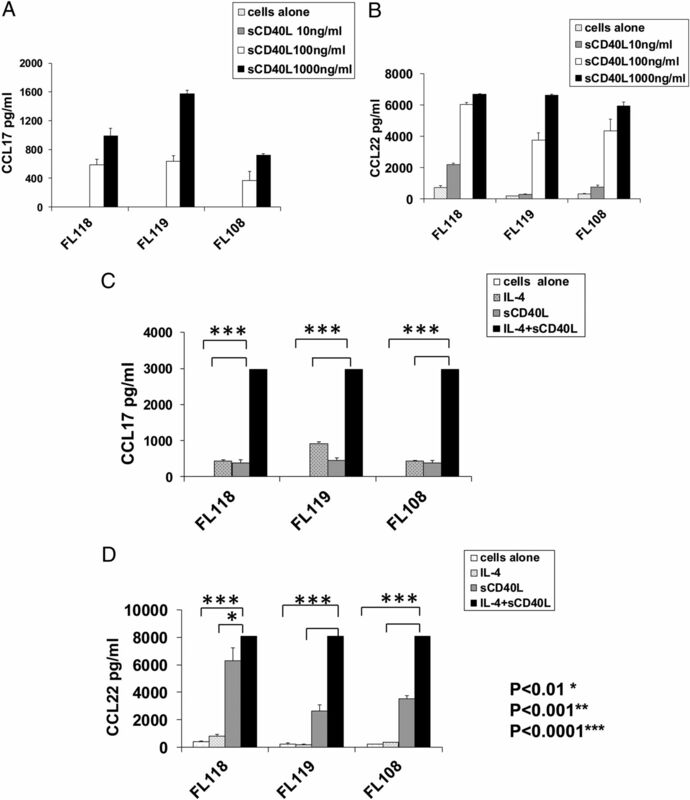 IL-4 alone induces only CCL17 but enhances stimulation by CD40L of both CCL17 and CCL22. Consistent with our in vitro results, mRNA transcripts of IL-4 correlated with CCL17, but not CCL22, in gene expression profiling studies of FL biopsies, whereas CD40L correlated with both CCL17 and CCL22. Tumor supernatants induced preferential migration of Tregs and IL-4–producing T cells rather than IFN-γ–producing T cells, and Abs to CCR4 significantly abrogated the migration of Tregs. Our results suggest that through two distinct mechanisms, intratumoral TFH induce production of CCL17 and CCL22 by FL tumor cells and facilitate active recruitment of Tregs and IL-4–producing T cells, which, in turn, may stimulate more chemokine production in a feed-forward cycle. Thus, TFH appear to play a major role in generating an immunosuppressive tumor microenvironment that promotes immune escape and tumor survival and growth. Our results provide novel insights into the cross talk among TFH, tumor cells, and Tregs in FL, and offer potential targets for development of therapeutic strategies to overcome immune evasion. Follicular lymphoma (FL) is the most common indolent B cell lymphoma (BCL) and comprises 22% of all non-Hodgkin’s lymphomas worldwide (1). FL is derived from germinal center B cells and is characterized by hyperexpression of the antiapoptotic Bcl-2 oncoprotein as a consequence of the t(14;18) BCL2/JH translocation (2). However, the t(14;18) translocation does not appear to be sufficient for lymphomagenesis, because B cells with the t(14;18) translocation can be found in a substantial proportion of healthy individuals (3, 4). Moreover, lymphomas develop in only 10–15% of transgenic mice in which BCL2 expression was driven by an IgH enhancer (Eμ) (5). Therefore, growth factors such as cytokines and other protumor factors present in the tumor microenvironment may be necessary for the pathogenesis and progression of FL (6). Recently, using proteomic profiling of tumor lysates, Calvo et al. (7) found that IL-4 levels were significantly higher in FL tissues than in tissues from follicular hyperplasia. Furthermore, they demonstrated increased basal phosphorylation of downstream targets of IL-4, STAT6, and the MAPK Erk in FL tissues as compared with benign follicular hyperplasia in tonsils. Additional reports showed that follicular Th cells (TFH) express high levels of IL-4 and CD40L mRNA in FL and may be involved in promoting the survival of tumor B cells via IL-4 and CD40L (8, 9), consistent with other in vitro studies (10, 11). Together, these reports suggest that IL-4 and CD40L expressed by TFH may act as protumor factors and may play a role in the pathogenesis of FL. Evidence in the literature suggests that the FL tumor microenvironment also contains antitumor factors (6). The indolent nature of FL (12), induction of spontaneous remissions in patients who are observed without therapy (12), isolation of antitumor T cells from the tumor microenvironment (13, 14), and correlation of survival with the gene expression signature of tumor-infiltrating immune cells in FL patients (15) all support the assertion that antitumor factors are present in the tumor microenvironment in FL and suggest that FL is naturally immunogenic. Furthermore, the induction of antitumor immune responses in most FL patients after idiotypic vaccination (16, 17), the high clinical response rates observed with the anti-CD20 mAb rituximab (18, 19), and prolonged progression-free survival (PFS) after nonmyeloablative allogeneic stem-cell transplantation (20) suggest that FL is highly immune responsive. However, immunosuppressive cells such as Foxp3+ regulatory T cells (Tregs) and macrophages present in the FL tumor microenvironment may limit the efficacy of antitumor immune responses that are both naturally and therapeutically induced, and thus may exert a protumor effect (21). Consequently, the natural history of FL in patients who are observed without therapy as well as clinical outcome of patients undergoing therapeutic intervention are likely to depend on the relative dominance of the protumor and antitumor factors within the tumor microenvironment. Characterization of such factors and studying the dynamic interactions between the tumor and microenvironmental cells are necessary to provide a better understanding of the pathogenesis and course of FL. Tregs are among the most potent suppressors of effector T cells and other immune cells (22). Tregs have been shown to inhibit T cell responses against both foreign Ags and self-Ags such as tumor Ags. Several reports have suggested that Tregs are increased in number in the tumor microenvironment of a variety of human cancers including FL (22–26), and intratumoral Tregs from BCL patients have been shown to inhibit the function of antitumor CD4+ and CD8+ T cells (23, 27, 28). Tregs may be increased in number in FL via induction from conventional CD4+ T cells by the tumor cells (26, 29, 30). Alternatively, Tregs may also be actively recruited to the tumor site by chemokine expression in the tumor microenvironment. In FL, CCL17 (thymus and activation-regulated chemokine) and CCL22 (macrophage-derived chemokine) produced by the tumor cells have been proposed to play a role in recruiting Tregs into the tumor microenvironment (23, 30). However, the mechanism leading to the increased production of these chemokines by FL tumor cells is unknown. CCL17 is constitutively expressed by thymocytes, monocyte-derived dendritic cells, and keratinocytes (31, 32), and CCL22 is constitutively expressed by macrophages, dendritic cells, keratinocytes, and epithelial cells (33). However, B cells are not known to constitutively express either of these chemokines. 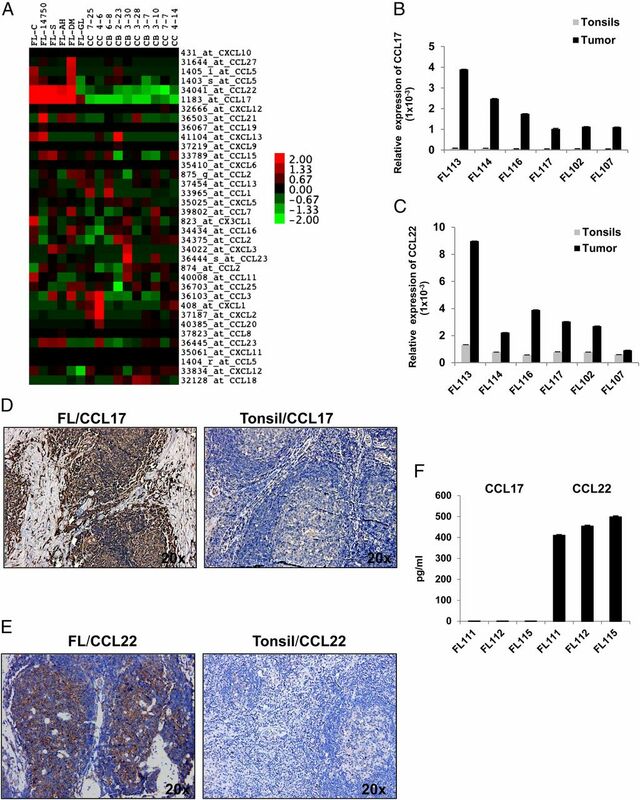 In this article, we demonstrate that CCL17 and CCL22 are produced by tumor cells in FL as a result of cross talk with TFH. Furthermore, we show that these chemokines induce preferential migration of Tregs and IL-4–producing CD4+ T cells that, in turn, might stimulate more chemokine production, thus creating a vicious cycle and an immunosuppressive tumor microenvironment that promotes immune evasion and tumor survival and growth. These results provide novel insights into the role of TFH in immune evasion in FL and offer potential targets for the development of therapeutic strategies. All blood and tissue samples were obtained after informed consent from patients through an Institutional Review Board–approved protocol. Lymph node biopsies were obtained from patients with FL at the time of their initial diagnosis before therapy. Tonsils were obtained from children who had undergone elective tonsillectomy. The use of tonsils with benign follicular hyperplasia as controls for FL has generally been accepted in the scientific literature (7, 15, 34). Surgical samples were stored as formalin-fixed tissue sections in paraffin and/or processed into a single-cell suspension and cryopreserved. Because of limited number of cells obtained from each tumor or tonsil, the same samples could not be used in all experiments. Altogether, 21 tumors and 14 tonsil samples were used for the various in vitro studies. Serum samples were obtained from healthy donors and patients with FL at the time of their initial diagnosis (Supplemental Table I). All FL patients were treated uniformly with prednisone, doxorubicin, cyclophosphamide, and etoposide chemotherapy followed by autologous tumor-derived idiotype vaccination (16, 35). Mantle cell lymphoma cell lines (Mino and Granta519), transformed FL cell lines that carry t(14;18) (RL, DHL-16, DOHH-2), diffuse large BCL cell lines (EJ-1 and SKI), germinal center B cell–derived diffuse large BCL cell lines (SU-DHL-4, PFEIFFER, and TOLEDO), and Burkitt’s lymphoma cell lines (Raji and Daudi) were cultured in RPMI 1640 supplemented with 10% FBS, 10 mM Hepes, 1× GlutaMAX, 50 μM 2-ME, 1 mM sodium pyruvate, 100 U/ml penicillin + 100 μg/ml streptomycin, and 10 μg/ml gentamicin (all from Invitrogen) at 37°C and 5% CO2 in air. CD3 allophycocyanin, CD4 PerCP-Cy5.5, CD8 PerCP-Cy5.5, CD10 allophycocyanin, CD20 FITC, CD25 FITC, CD127 PerCP-Cy5.5, IL-4Rα PE, IL-4 PE, IL-13 PE, IFN-γ allophycocyanin, phospho-STAT6 allophycocyanin (Tyr641), and CCR4 PE were all obtained from BD Biosciences. κ FITC and λ FITC were obtained from Invitrogen. Foxp3 PE (clone PCH101) was obtained from eBioscience. ELISA kits for CCL17 and CCL22 were obtained from R&D Systems. Neutralizing Abs against CCL17 and CCL22 were obtained from R&D Systems. PMA and ionomycin were obtained from Sigma-Aldrich. Recombinant human IL-4, recombinant human IL-13, recombinant human CCL17, recombinant human CCL22, and CCL17 and CCL22 Abs for immunohistochemical staining were obtained from PeproTech. IL-4, phospho-STAT6 (Tyr641), and Foxp3 Abs for immunohistochemical staining were obtained from Abcam. Anti-mouse IgG Ab (BA-2000) and anti-rabbit Ab (BA-1000) were obtained from Vector Laboratories. STAT6, phospho-STAT6 (Tyr641), and β-actin Abs for Western blot analysis were obtained from Cell Signaling Technology. For TFH staining, CD4 Amcyan, CD3 allophycocyanin-Cy7, CXCR5 Alexa488, BCL6 PE, ICOS allophycocyanin, and CD40L PerCP-Cy5.5 were obtained from BD Biosciences, and PD1 PE was from eBioscience. Tumor cells were isolated from single-cell suspensions of lymph node biopsies or from surgical samples from patients with lymphoma by depleting T cells using CD3 magnetic beads (Miltenyi Biotec) as described previously (17). The procedure yielded tumor B cells of >99% purity as determined by surface staining for CD10, CD20, and monoclonal light-chain restriction. Tregs were isolated by MACS using Regulatory T Cell Isolation Kit (Miltenyi Biotec) according to the manufacturer’s instructions. To isolate non-Tregs, we isolated CD4+ T cells using CD4+ T Cell Isolation Kit and then depleted that cell fraction of Tregs using CD25 magnetic beads (Miltenyi Biotec). These procedures yielded >90% purity of Tregs (CD4+CD25+CD127loFoxp3+) and non-Tregs (CD4+CD25−Foxp3−), as determined by flow cytometric analysis. Surface staining and Foxp3 (eBioscience) and phospho-STAT6 (BD Biosciences) staining for flow cytometric analysis were performed according to the manufacturer’s instructions. Samples were acquired using a BD FACSCalibur system (BD Biosciences) and analyzed using Cell Quest Pro (BD Biosciences) or FlowJo (Tree Star) software. TFH identified as CD3+CD4+CD25−PD1hiCXCR5hi were sorted using FACSAria (Becton Dickinson, San Diego, CA). Purity of sorted TFH was >98%. Total RNA was extracted from purified tumor and tonsil B cells using TRIzol reagent (Invitrogen), followed by treatment with DNase (Ambion). Real-time PCR was performed on the ABI Prism 7900 using Power SYBR Green RNA-to-CT 1-Step Kit according to the manufacturer’s instructions (Applied Biosystems). Primers for CCL17 (Hs00171074) and CCL22 (Hs00171080) were obtained from Applied Biosystems. GAPDH was used as an endogenous control (Integrated DNA Technologies). The ΔΔCt method was used to calculate the proportional difference in CCL17 and CCL22 expression in tumor B cells and tonsil B cells. Formalin-fixed paraffin-embedded tissue sections were deparaffinized and rehydrated, and Ag retrieval was performed according to the manufacturer’s protocol (Vector Laboratories). Tissue sections were treated for 5 min with 0.3% hydrogen peroxide solution to block endogenous peroxidase and then incubated with a blocking buffer (1% BSA in PBS; Sigma) for 5 min at room temperature. Next, slides were incubated with primary Abs overnight at 4°C at a dilution of 1:100 in blocking buffer; then the slides were washed and incubated for 30 min with appropriate secondary Abs in blocking buffer. The sections were stained using DAB solution (Vector Laboratories). Digital photomicrographs were acquired using DP Controller software (Olympus) mounted on a BX41 Clinical Microscope (Olympus). Expression of chemokine genes, IL-4, IL-13, IL-4R, and IL-13R in tumor cells isolated from FL biopsies and B cells isolated from reactive tonsils were obtained from a publicly available microarray data set (http://icg.cpmc.columbia.edu/Web_Data/JCI/2003_JCI.htm) (34). Log2-transformed data were analyzed for relative levels of gene expression. Data from the Oncomine database (https://www.oncomine.org/resource/login.html) were also similarly displayed for expression of CCL17 and CCL22 mRNA in multiple lymphoproliferative disorders. Whole-genome gene expression data from the study of Dave et al. (15) were obtained from a publicly available source (http://llmpp.nih.gov/FL/). After log2 normalization and reannotation of the microarray version used (06/09/2011; Release 32, http://www.affymetrix.com), data for selected genes were examined for pairwise correlation by Pearson correlation and Spearman rank correlation coefficients, with significance for the Pearson correlation coefficient determined assuming no relationship in the population. The Pearson correlation coefficient for selected genes of relevance to immune cell types were calculated and displayed as a correlation matrix heat map, as pioneered by Tosolini et al. (36). Tumor cells or intratumoral T cells were cultured in the presence or absence of the indicated stimuli, and cytokines or chemokine levels were assessed in the supernatants after 48 h by ELISA or multiplex assays according to the manufacturer’s instructions. For intracellular cytokine assay, cells were cultured in the absence or presence of PMA (50 ng/ml) and ionomycin (500 ng/ml) for 14 h. Brefeldin A (5 μg/ml; Sigma-Aldrich) was added for the last 12 h of the incubation, and the cells were harvested, fixed, permeabilized, and stained for surface markers and intracellular cytokines by fluorochrome-labeled mAbs as previously described (37). Tumor cells were cultured in the absence or presence of IL-4 (20 ng/ml), and supernatants were harvested after 48 h for chemotaxis assay. Tumor supernatants or recombinant CCL17 and CCL22 (200 ng/ml each) were plated in triplicate in the lower chambers of a transwell plate, and Tregs or non-Tregs (2 × 105 cells/well) were plated in triplicate in the upper chambers of a transwell plate separated by a 5-μm pore polycarbonate filter (Corning) and cultured for 2 h. Cells that migrated across the filter were recovered and counted using the trypan blue exclusion method. The percentage of cells that had migrated was calculated using the following formula: (number of cells migrated into the lower chamber/number of cells seeded in the corresponding upper chamber) × 100. The inhibition of chemotaxis was assessed using anti-CCR4–blocking Ab (20 μg/ml). Chemotaxis inhibition was calculated as a percentage using the following formula: [(X − Y)/X] × 100, where X is the fraction of cells that migrated in the absence of Abs and Y is the fraction of cells that migrated in the presence of Abs. Approximately 2–4 × 106 tumor cells were lysed in a buffer composed of 50 mM Tris-Cl (pH, 7.4), 5 mM EDTA, 150 mM NaCl, 0.5% Triton-X 100, 1 mg/ml leupeptin and aprotinin, and 1 mM PMSF. Protein content of the cell lysates was quantified using the Bradford assay (Bio-Rad), and 25 μg total protein was dissolved in Laemmli SDS-PAGE sample buffer before separation in 10% SDS-PAGE gels. After electrophoresis, proteins were transferred to a nitrocellulose membrane (Bio-Rad) for Western blot analysis with anti-STAT6 or anti–phospho-STAT6 Abs (1:1000 dilution each) for 1 h at room temperature or at 4°C overnight. Bound Abs were detected with HRP-conjugated secondary Abs diluted at 1:2000 and with SuperSignal West Pico Substrate (Thermo Scientific). Granta519 cells were transfected with STAT6-specific small interfering RNA (siRNA) (5′-GGGAGAAGAUGUGUGAAACUCUGAA-3′ and 5′-GAAUCCGGGAUCUUGCU CAGC UCAA-3′) (38) or a Universal Stealth siRNA negative control (40 nmol each; Invitrogen) or transfection control pmaxGFP (Amaxa) using Nucleofector Kit V (Amaxa) according to manufacturer’s instructions. After 24 h, transfection efficiency was determined by flow cytometric analysis, and 55–60% of the transfected cells was found to be positive for GFP. Knockdown of STAT6 and phospho-STAT6 was determined by Western blot analysis. Transfected cells were incubated with IL-4 (20 ng/ml) for an additional 24 h, and chemokine production was assessed in the supernatants by ELISA. Differences between chemokine levels between unpaired experimental groups were determined using the Wilcoxon rank sum test using Prism software (GraphPad Software). Differences between paired test and control samples were assessed by two-sided paired Student t test using Microsoft Excel 2007. The p values <0.05 were considered statistically significant. PFS was defined as time from initiation of treatment to the time of progression or death, whichever occurred first, or to the time of last contact. PFS was estimated using the Kaplan–Meier method. Log rank test was performed to test the difference in survival times between groups. Multivariate regression models were developed to examine the effect of chemokine level adjusted for Follicular Lymphoma International Prognostic Index (FLIPI) score (39). Regression analyses of PFS data were conducted using the Cox proportional hazards model. Because of the skewed nature of distribution of the two chemokines CCL17 and CCL22, a logarithm (base 2) transformation was used in the analysis when included in the regression models as a continuous variable. SAS version 9.2 and S-Plus version 8.04 were used to carry out the statistical analyses. Calvo et al. (7) described an increase in IL-4 in FL tumor lysates but did not identify the source of IL-4. Pangault et al. (8) showed that TFH cells in FL have high levels of IL-4 mRNA but did not confirm IL-4 expression at protein level. Moreover, expression of Bcl6, the master transcription factor for TFH differentiation, was not assessed. In this study, we conclusively demonstrated that the CD4+PD-1hiCXCR5hi T cells are the major source of IL-4 in FL and expressed high levels of Bcl6, as well as ICOS and CD40L, suggesting that they represented TFH (Fig. 1A–C). Consistent with our in vitro results, we found a moderate degree of correlation between IL-4 mRNA and genes associated with TFH such as CD40L, MAF, PDCD1, and ICOS in gene expression arrays of whole-tumor tissues from FL patients reported previously by Dave et al. (15) (Fig. 1D). From the same data set, we calculated a self-correlation matrix of genes associated with a number of different immune cell subsets, which showed that IL-4 is most closely associated with a cluster of TFH-associated genes that is distinct from a Th1/T cytotoxic cell 1 cluster, as well as genes associated with Th2, Th17, NK cells, macrophages, myeloid DC, and plasmacytoid DC (Supplemental Fig. 1A). These results suggest that the observed correlations between IL-4 and TFH genes are indeed specific. Consistent with this, IL-4 production was observed in T cell cultures but was negligible in non–T cell cultures (Supplemental Fig. 1B, 1C). More importantly, we found that IL-4–expressing T cells are increased in FL compared with tonsil controls (Fig. 1E, 1F). To determine whether FL tumor cells respond to IL-4 produced in the tumor microenvironment, we evaluated the expression of IL-4Rα by flow cytometric analysis. We found that FL tumor cells and a subset of intratumoral T cells expressed IL-4Rα (Supplemental Fig. 1D). Moreover, IL-4Rα mRNA was hyperexpressed in FL tumor cells compared with germinal center B cells (both centrocytes and centroblasts) from reactive tonsils (Supplemental Fig. 1E, 1F). Taken together, these results indicate that IL-4 is produced predominantly by TFH, and IL-4–expressing T cells are increased in FL. 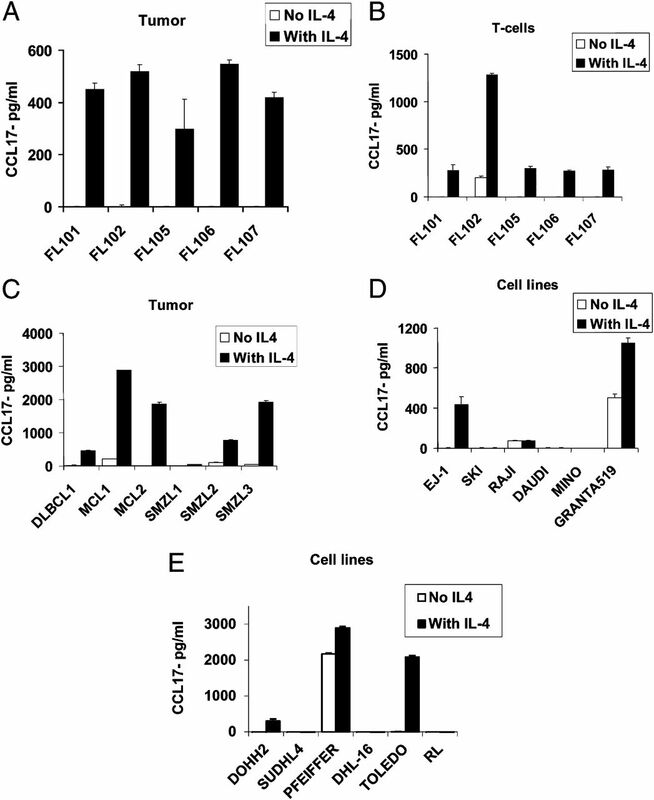 IL-4–producing T cells are increased in the FL tumor microenvironment. (A) Multiparametric flow cytometry was performed on intratumoral T cells. Intratumoral CD4+ T cells were gated into three subsets based on PD-1 and CXCR5 (PD-1hiCXCR5hi, PD-1intCXCR5int, and PD-1loCXCR5lo), and expression of Bcl6, ICOS, and CD40L was determined. Mean fluorescence intensity of CD40L is indicated in the histogram for the three subsets. (B) Intratumoral CD4+ T cells were sorted into PD-1hiCXCR5hi, PD-1intCXCR5int, and PD-1loCXCR5lo subsets, and expression of IL-4 and Bcl6 was determined by real-time PCR. (C) Intratumoral CD4+ T cells were incubated for 12 h in the presence or absence of PMA and ionomycin. Brefeldin A was added for the last 10 h, and expression of IFN-γ and IL-4 versus PD-1 expression is shown in CD4+ T cells by flow cytometry. (D) The correlation between mRNA transcripts of IL-4 and that of CD40L, MAF, PDCD1, and ICOS was determined in the microarray data set of 191 FL tumors published previously by Dave et al. (15). Pearson correlation coefficient (r) and Spearman rank correlation coefficient (rho) are shown. (E and F) T cells isolated from FL biopsy samples or reactive tonsils (n = 5 each) were stimulated as in (C). IL-4 and IFN-γ production was assessed in CD3+ T cells by intracellular cytokine staining, and the percentage of T cells producing cytokine was determined. Representative data (E) and data from five pairs of samples (F) are shown. Statistical significance was determined by Wilcoxon rank sum test. Binding of IL-4 to its receptor in hematopoietic cells activates the tyrosine kinases Jak1 and Jak2; this process results in recruitment and phosphorylation of STAT6, leading to STAT6’s dimerization and translocation to the nucleus where it activates STAT6-responsive genes (40, 41). Consistent with the fact that IL-4 was produced in the tumor microenvironment in FL, we observed that phospho-STAT6 was present at low levels in tumor cells from primary FL samples but was substantially enhanced by IL-4 (Fig. 2A, 2B). Furthermore, using immunohistochemical staining, we found that phospho-STAT6 was increased in primary FL biopsy samples compared with tonsil controls (Fig. 2C). 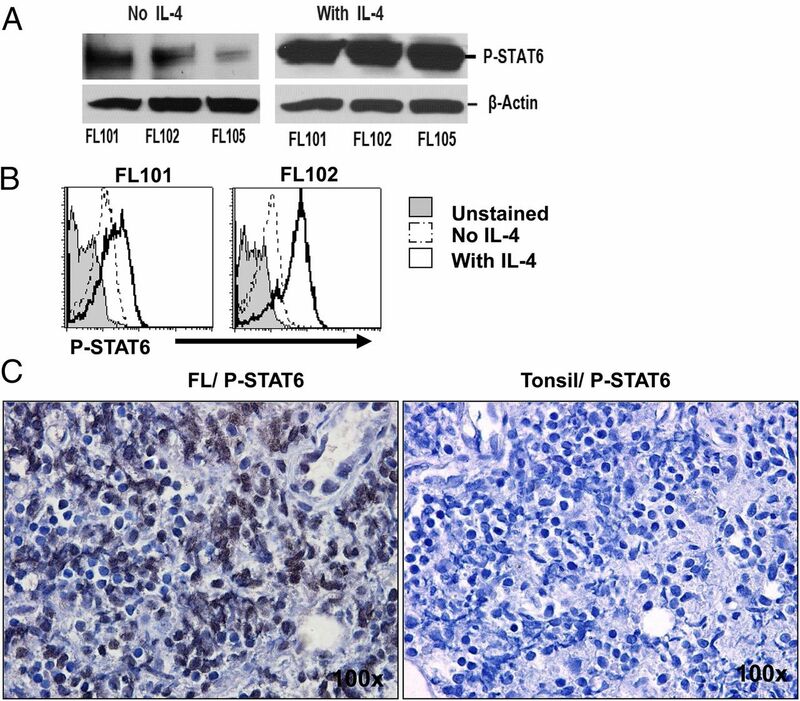 Collectively, these results suggested that the increase in IL-4 induced enhanced phosphorylation of STAT6 in FL tumors compared with tonsils. IL-4 induces phosphorylation of STAT6 in FL tumor B cells. (A and B) Tumor cells isolated from FL biopsy samples were incubated in the absence or presence of IL-4 (20 ng/ml) for 15 min, and expression of phospho-STAT6 (P-STAT6) was determined by Western blot analysis (A) or phosflow (B). Data shown are representative of three independent experiments (A) and eight FL patient samples tested (B). (C) Immunohistochemical staining for phospho-STAT6 (dark brown) was performed on formalin-fixed, paraffin-embedded FL (left panel) and tonsil (right panel) tissues. Original magnification ×100. Because CCL17 and CCL22 are STAT6-responsive genes (41), we used publicly available cDNA microarray data (available from http://www.ncbi.nlm.nih.gov/geo/query/acc.cgi?acc=GSE2350 and https://www.oncomine.org/resource/login.html) (34) to determine whether these genes are hyperexpressed in BCLs relative to other chemokines. We compared the expression patterns of 32 chemokine mRNAs in FL tumors and germinal center B cells (both centrocytes and centroblasts) from tonsil controls and observed that CCL17 and CCL22 were hyperexpressed in five of six FL tumor B cell specimens (Fig. 3A, Supplemental Fig. 2A). 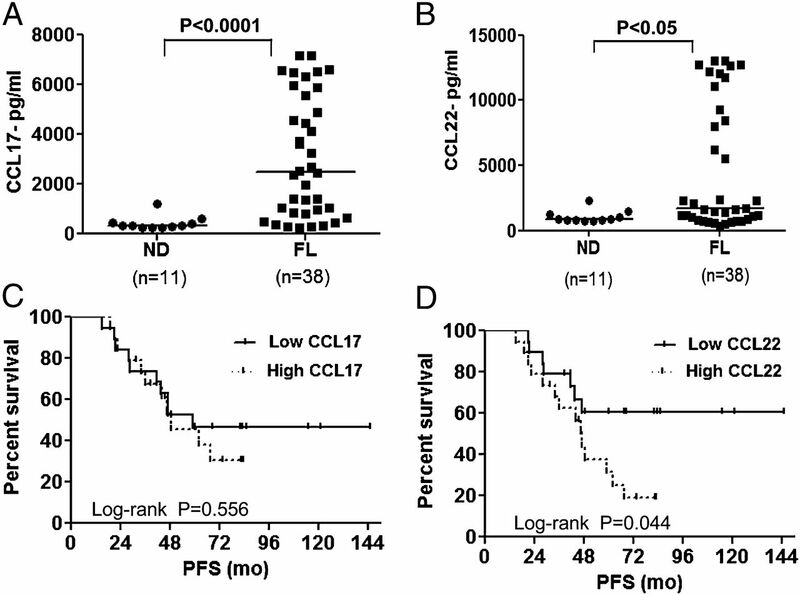 CCL17 and/or CCL22 were also hyperexpressed in Hodgkin’s lymphoma, Burkitt’s lymphoma, chronic lymphocytic leukemia, diffuse large BCL, and mantle cell lymphoma (Supplemental Fig. 2B, 2C). The hyperexpression of CCL17 and CCL22 in FL tumor cells was confirmed at the mRNA level by real-time PCR (Fig. 3B, 3C) and at the protein level by immunohistochemical analysis (Fig. 3D, 3E). However, in ex vivo cultures, CCL22, but not CCL17, was spontaneously produced, which indicates that the secretion of CCL17 by FL tumor cells may be dependent on paracrine signals from the tumor microenvironment (Fig. 3F). CCL17 and CCL22 are increased in FL. (A) Expression of relative chemokine mRNA levels in FL tumors (n = 6) and germinal center B cells (centrocytes [CC] and centroblasts [CB]) from reactive tonsils (n = 5 each) that were purified by depleting T cells, NK cells, and monocytes/macrophages using immunomagnetic beads were determined using publicly available cDNA microarray data (available from http://icg.cpmc.columbia.edu/Web_Data/JCI/2003_JCI.htm) and shown as a heat map. Log2-transformed data are median centered for each gene, and variation from the median is indicated by the color bar. (B and C) Real-time PCR was performed to assess the expression of CCL17 (B) and CCL22 (C) mRNA in purified FL tumors (n = 6; 95.7–97.9% pure) and reactive tonsil B cells (n = 6; 98.7–99.6% pure). Expression of the chemokine genes relative to GAPDH in each sample is shown. (D and E) Immunohistochemical staining for CCL17 (D) and CCL22 (E) was performed on formalin-fixed, paraffin-embedded FL (left panels) and tonsil (right panels) tissues. Original magnification ×20; images are representative of data from three different FL tumors. (F) Tumor cells isolated from three FL biopsy samples were incubated for 48 h, and spontaneous production of CCL17 and CCL22 was assessed in the culture supernatants by ELISA. CCL17 and CCL22 were also significantly increased in the serum of FL patients at diagnosis compared with normal donors (Fig. 4A, 4B, Supplemental Table I) and interestingly, high levels of serum CCL22, but not CCL17, at diagnosis correlated with poor PFS compared with patients with low levels of CCL22 (median PFS of 47 mo versus not reached, log rank p = 0.044; Fig. 4C, 4D). With the adjustment of FLIPI risk score (low-intermediate versus high) in multivariate Cox proportional hazard model, CCL22 remained significant. Patients with higher CCL22 had larger hazard of progression than those with lower CCL22 (hazard ratio = 1.38 [95% CI 1.013–1.887] per unit increase of CCL22 on a log base 2 scale; p = 0.041). Correlation with overall survival could not be performed, as there were only 2 deaths in the entire cohort of 38 patients. Neither the CCL17 nor CCL22 levels were significantly different (p > 0.05) between the FLIPI risk groups (low-intermediate versus high), suggesting that the serum chemokine levels were not just markers of tumor burden. CCL17 and CCL22 are increased in the serum of FL patients and CCL22 is predictive of inferior PFS. The levels of CCL17 (A) and CCL22 (B) were determined by ELISA in the serum of FL patients at diagnosis (n = 38) and in normal donors (ND; n = 11). Horizontal bars represent the mean values for each group. Statistical significance was determined by Wilcoxon rank sum test. (C and D) Kaplan–Meier survival curves for PFS in FL patients with high (greater than median, n = 19) and low (less than or equal to median, n = 19) serum levels of CCL17 and CCL22 at diagnosis and treated uniformly with prednisone, doxorubicin, cyclophosphamide, and etoposide chemotherapy followed by autologous tumor-derived idiotype vaccination are shown. The p value was calculated by log rank test. Because IL-4 was previously shown to induce CCL17 in myeloid cells via STAT6 (42), we determined whether IL-4 induced production of CCL17 by FL tumor cells. We cultured purified tumor B cells in the presence or absence of IL-4 and assessed the production of CCL17 in the culture supernatants. Because IL-4Rα was also expressed on a subset of intratumoral T cells (Supplemental Fig. 1D), we also tested the effect of IL-4 on T cells. We observed that IL-4 induced significant production of CCL17 by both tumor cells (Fig. 5A) and intratumoral T cells (Fig. 5B) in FL. Of interest, IL-4 also induced significant production of CCL17 in primary tumor cells derived from diffuse large BCL, mantle cell lymphoma, and splenic marginal zone lymphoma (Fig. 5C), as well as a transformed FL cell line (DOHH-2), diffuse large BCL cell lines (EJ-1, PFEIFFER, and TOLEDO), and a mantle cell lymphoma cell line (Granta519; Fig. 5D, 5E). However, IL-4 had minimal effect on the production of CCL22 in FL (Supplemental Fig. 3A, 3B) and in other BCLs and cell lines (Supplemental Fig. 3C–E). Together, these results indicated that CCL17 was induced by IL-4 in FL and other BCLs. IL-4 induced production of CCL17 by lymphoma tumor cells. (A–E) Tumor cells (A, C) and intratumoral T cells (B) isolated from lymphoma biopsy samples (A–C) or lymphoma cell lines (D, E) were incubated in triplicate in the presence or absence of IL-4 (20 ng/ml). After 48 h, CCL17 production was assessed in the culture supernatants by ELISA. DLBCL, diffuse large BCL; MCL, mantle cell lymphoma; SMZL, splenic marginal zone lymphoma; EJ-1, SKI, SUDHL4, PFEIFFER, and TOLEDO, DLBCL cell lines; RL, DHL-16, and DOHH2, transformed FL cell lines; Raji and Daudi, Burkitt’s lymphoma cell lines; and Mino and Granta519, MCL cell lines. To determine whether the induction of CCL17 by IL-4 is STAT6 dependent in BCLs, we assessed the effect of STAT6 knockdown on CCL17 production in Granta519 cells. We found that IL-4 enhanced the phosphorylation of STAT6 in the mantle cell lymphoma cell line Granta519 (Fig. 6A). Using STAT6-specific siRNA, but not control siRNA, we were able to substantially knock down STAT6 and phospho-STAT6 in Granta519 (Fig. 6B). After we cultured these transfected cells in the presence of IL-4, we observed that CCL17 production was markedly inhibited in cells transfected with STAT6-specific siRNA compared with control siRNA (Fig. 6C). Induction of CCL17 by IL-4 in diffuse large B cell lines (DOHH2, TOLEDO, and PFEIFFER) was also associated with phosphorylation of STAT6 (Fig. 6D). 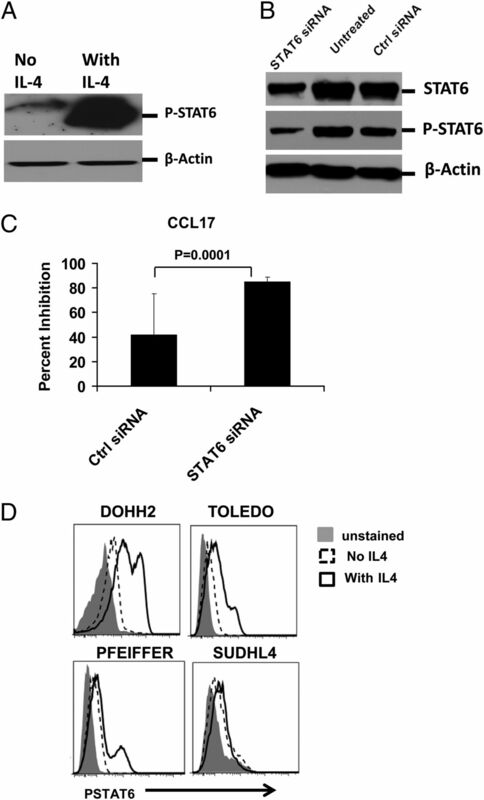 In contrast, the SUDHL4 cell line did not produce CCL17 in response to IL-4 (Fig. 5E) and had minimal induction of phospho-STAT6 (Fig. 6D). Together, these results indicated that IL-4 induced CCL17 in BCLs by activating phospho-STAT6. Induction of CCL17 by IL-4 in tumor B cells was STAT6 dependent. (A and D) Granta519 cells and other lymphoma cell lines (D) were incubated in the absence or presence of IL-4 (20 ng/ml) for 15 min, and expression of phospho-STAT6 (P-STAT6) was determined by Western blot analysis (A) or phosflow (D). (B) Granta519 cells were transfected with STAT6-specific siRNA or Universal Stealth siRNA negative control; after 24 h, levels of STAT6 and phospho-STAT6 were determined by Western blot analysis in untreated and transfected cells. (C) Granta519 cells were transfected as described earlier in triplicate and incubated with IL-4 for an additional 24 h, and CCL17 production was assessed in the supernatants by ELISA. Percent inhibition of CCL17 production as compared with untransfected cells is shown. Statistical significance was determined by two-sided paired Student t test. Because CD40L can stimulate production of CCL17 and CCL22 from B cells (43, 44) and is hyperexpressed on the IL-4–producing TFH (Fig. 1C), we determined whether it might play a role in the induction of these chemokines in FL. 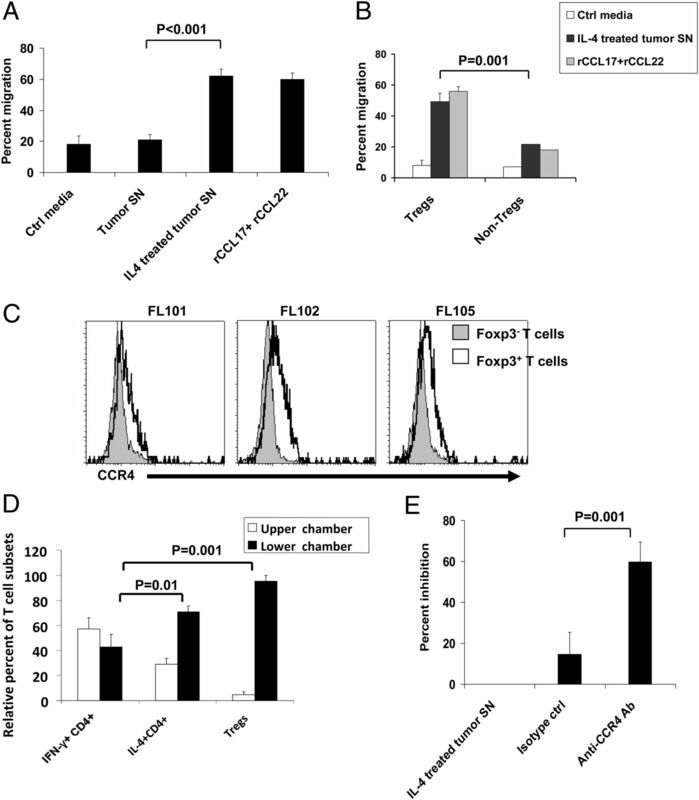 We found that CD40L induced significant production of CCL17 and CCL22 by tumor cells (Fig. 7A, 7B) in FL. Interestingly, there was marked synergism between CD40L and IL-4 in the production of both chemokines (Fig. 7C, 7D). Consistent with our in vitro results (Figs. 5A, 7, Supplemental Fig. 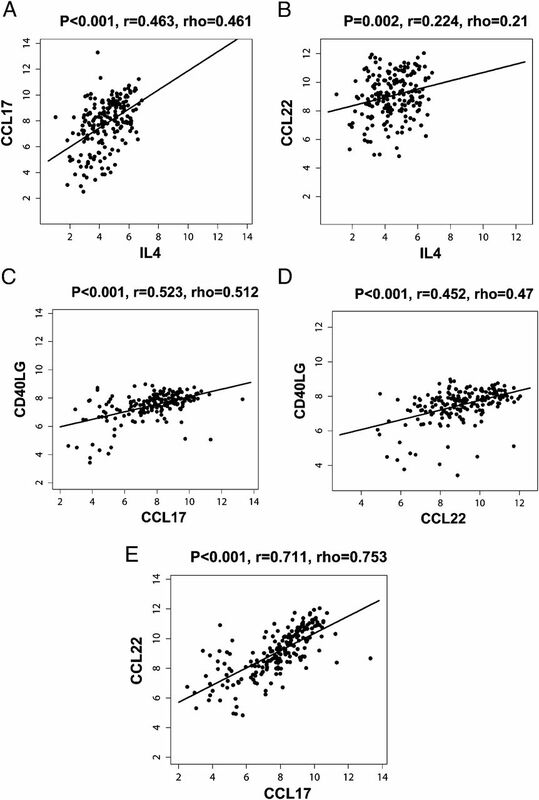 3A), we found a moderate degree of correlation between mRNA transcripts of IL-4 and CCL17, but not CCL22, in gene expression microarray studies of FL tumors (Fig. 8A, 8B). In contrast, CD40L mRNA transcripts correlated with both CCL17 and CCL22 (Fig. 8C, 8D). This suggests that the expression of IL-4 and CD40L may be differentially regulated in TFH and/or expression of CD40L by non-TFH, although at lower levels (Fig. 1A) may contribute to the expression of these chemokines. We also found a strong correlation between CCL17 and CCL22, suggesting that these genes may be coregulated (Fig. 8E). CD40L induced production of CCL17 and CCL22, and has synergistic effects with IL-4. Tumor cells isolated from three FL biopsy samples were incubated in triplicate (1 × 106 tumor cells/well) in the presence or absence of varying concentrations of recombinant human soluble CD40L (sCD40L) alone (A, B) or at 100 ng/ml sCD40L (C, D), IL-4 alone (20 ng/ml), or both (C, D). After 48 h, CCL17 and CCL22 production was assessed in the culture supernatants by ELISA. All p values were calculated using paired Student t test. IL4 mRNA transcripts correlated with CCL17 and CD40L correlated with both CCL17 and CCL22. The correlation between mRNA transcripts of IL-4 (A and B) and CD40L (C, D) versus CCL17 (A, C) and CCL22 (B, D) was determined in the microarray data set of 191 FL tumors published previously by Dave et al. (15). (E) Correlation between CCL17 and CCL22 mRNA transcripts for the same data set. Pearson correlation coefficient (r) and Spearman rank correlation coefficient (rho) are shown. In agreement with the earlier results, coculture of FL tumor cells with autologous intratumoral TFH showed production of both CCL17 and CCL22 into the culture supernatants (Fig. 9A, 9B). We also observed similar production of CCL17 and CCL22 when B cells from tonsils were cocultured with autologous TFH (Fig. 9C, 9D). The lower amount of chemokine production seen in the tumor-TFH cocultures (Fig. 9A, 9B) compared with recombinant proteins (Fig. 7) is probably due to the lower number of tumor cells used per well (Fig. 9A, 9B) relative to the experiment with rIL-4 and CD40L (Fig. 7), and due to the likely suboptimal function of cryopreserved TFH compared with freshly isolated TFH or TFH in vivo (45). Nevertheless, these results suggested that TFH express IL-4 and CD40L, presumably after cognate recognition of an MHC-associated peptide presented on the surface of tumor B cells, and induce production of CCL17 and CCL22 by FL tumor cells. CCL17 and CCL22 are induced in autologous tumor-TFH cocultures. TFH (CD3+CD4+CD25−PD1hiCXCR5hi) were sorted by FACS from three cryopreserved FL biopsy samples and three tonsil samples. They were cultured in the absence or presence of autologous tumor cells or tonsil B cells (0.35 × 106 tumor cells/well). After 96 h, CCL17 (A, C) and CCL22 (B, D) production was assessed in the culture supernatants by ELISA. All p values were calculated using paired Student t test. Because CCR4 is the only known chemokine receptor for CCL17 and CCL22, and is overexpressed on Tregs (46) and Th2 cells (47), we determined whether IL-4–treated tumor cells induced preferential migration of these cells. First, we cultured FL tumor cells in the presence or absence of IL-4 for 48 h and tested the ability of the culture supernatants to induce chemotaxis of T cell subsets. We found that culture supernatants from IL-4–treated tumor cells and recombinant CCL17 and CCL22 chemokines induced significant migration of Tregs in a chemotaxis assay. In contrast, the migration of Tregs in response to culture supernatants obtained from tumor cells alone was not significantly different from that observed with control media (Fig. 10A). Treg migration was also observed when recombinant CCL17 and CCL22 chemokines were used alone, and the migration was not significantly different between chemokine concentrations of 2, 20, and 200 ng/ml for CCL17 and CCL22 (data not shown). More importantly, culture supernatants from IL-4–treated tumor cells induced preferential migration of Tregs compared with non-Tregs (Fig. 10B), and this preferential migration was correlated with a higher expression of CCR4 in Tregs than in non-Tregs (Fig. 10C). This result may offer one mechanism for increased number of Foxp3+ Tregs in FL tumors compared with tonsils (23–26). 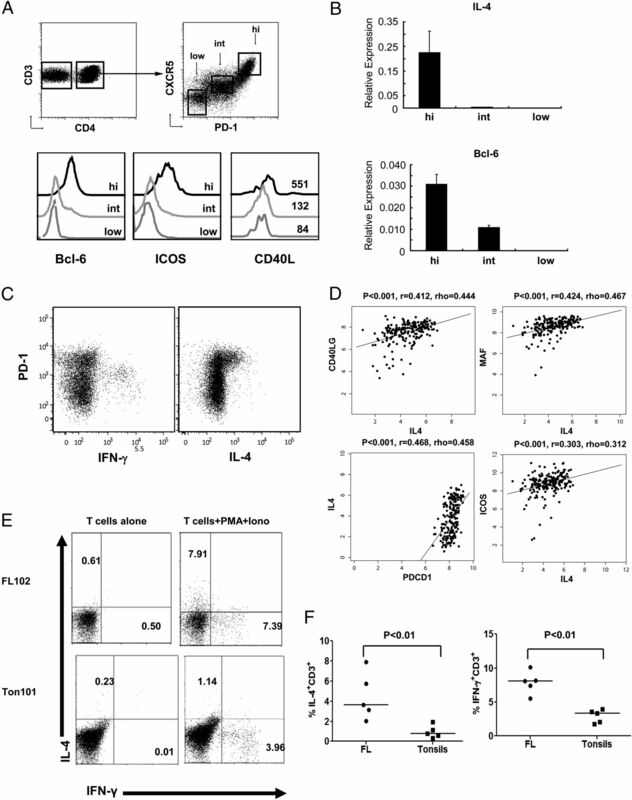 Preferential migration of Tregs and IL-4–producing CD4+ T cells. (A, B, and E) Tumor cells isolated from FL biopsy samples were incubated in the presence or absence of IL-4 (20 ng/ml) for 48 h, and culture supernatants (SN) were harvested for use in chemotaxis assays. (A and B) Tregs and non-Tregs were isolated to >90% purity from PBMC of normal donors by MACS and used in the chemotaxis assay in the presence or absence of control (Ctrl) media, tumor supernatants, and recombinant CCL17 and CCL22 (200 ng/ml each) as described in Materials and Methods. Representative data on the percentage of migration of Tregs and/or non-Tregs from four independent experiments are shown. (C) Expression of CCR4 was determined by flow cytometric analysis on CD4+Foxp3− (gray closed histograms) and CD4+Foxp3+ (black open histograms) T cells from three FL biopsy samples. Representative data from three of eight FL samples tested are shown. (D) Intratumoral T cells were isolated to >90% purity from FL102 tumor biopsy sample by MACS using Pan T Cell Isolation Kit and used in a chemotaxis assay in triplicate in the presence of control media (data not shown) or recombinant CCL17 and CCL22 (200 ng/ml each). After 2 h, cells were harvested separately from upper and lower chambers, and intracellular cytokine assay and Foxp3 staining were performed as described in Materials and Methods. The relative percentage of CD4+IFN-γ+IL-4−, CD4+IFN-γ−IL-4+, and Treg (CD4+CD25+CD127loFoxp3+) T cell subsets in the upper and lower chambers was determined using the following formula: (Percent T cell subset in upper or lower chamber × 100)/(total percent of T cell subset in upper and lower chambers). (E) Chemotaxis assay was performed with isolated Tregs as in (A). Percentage of inhibition of migration of Tregs by isotype control Ab and CCR4 blocking Ab was determined and shown as compared with IL-4–treated tumor SN. Data shown are representative of three independent experiments. All p values were calculated using paired Student t test. To determine the relative migration of Tregs, IFN-γ–producing (Th1), and IL-4–producing (Th2 or TFH) T cell subsets, we tested intratumoral T cells of FL in a chemotaxis assay. We observed that Tregs and IL-4–producing T cells migrated significantly more in response to CCL17 and CCL22 chemokines than IFN-γ–producing T cells (Fig. 10D). The migration of Tregs in response to tumor supernatants was significantly inhibited by anti-CCR4 blocking Ab, but not by isotype control Ab (Fig. 10E). Taken together, these results suggested that Tregs and IL-4–producing T cells might be recruited preferentially into the FL tumor microenvironment. Our results provide novel insights into the cross talk among TFH, tumor cells, and Tregs in FL. Prior reports suggested that TFH might play a role in promoting the survival and growth of FL tumor cells through IL-4 and CD40L (10, 11, 42, 45). Our data suggest that IL-4 and CD40L expressed by intratumoral TFH may have additional effects. We show that they induce expression of CCL17 and CCL22 through paracrine effects on tumor cells in FL. Although we observed similar induction of chemokines by tonsils samples in vitro (Fig. 9A–D), CCL17 and CCL22 were increased in FL tissues. This may be explained by the increased numbers of IL-4–producing T cells in FL (Fig. 1F). More importantly, we observed that these chemokines induce preferential recruitment of Tregs and IL-4–producing T cells rather than IFN-γ–producing T cells into the tumor microenvironment, thus creating a positive feedback cycle that may lead to further production of these chemokines and an immunosuppressive tumor microenvironment that facilitates immune escape and promotes the survival and growth of the tumor. This vicious cycle appears to be primarily driven by the increased number of IL-4–producing T cells in the tumor microenvironment. Although additional studies with larger numbers of patients are needed, the potential role of CCL22 in promoting tumor growth and escape is supported by our observation that FL patients with high serum level of this chemokine at diagnosis have inferior PFS (Fig. 4D). The lack of correlation between CCL17 and PFS suggests that CCL22 might play a more dominant role in the tumor microenvironment. Although we found increased levels of CCL17 and CCL22 in the serum of FL patients, their concentrations are likely to be higher in the tumor where they are produced compared with peripheral blood. Therefore, it is very probable that the chemokine gradient is in favor of active recruitment of Tregs and IL-4–producing T cells from the peripheral blood into the tumor microenvironment. The recruited Tregs may, in turn, suppress the function of tumor-specific effector T cells and other immune cells such as NK cells and dendritic cells, and promote immune evasion by the tumor. The increase in IL-4–producing T cells (Fig. 1F) and the basal phosphorylation of STAT6 in tumor cells observed in our studies (Fig. 2A–C) are consistent with recent reports (7, 42). IL-4+IFN-γ− CD4+ T cells have been classically described as Th2 cells, but recent reports suggest that IL-4 in secondary lymphoid organs is almost entirely produced by TFH cells; classical IL-4–producing Th2 cells migrate from the lymph node after activation and mediate effector function in the peripheral tissues (48). In agreement with this and other reports (42, 45), we observed that IL-4–producing T cells were TFH in FL (Fig. 1A–C). Recent reports also suggest that CXCR5+CD4+ T cells in the peripheral blood could be precursors of germinal center TFH cells seen in secondary lymphoid organs (49). More interestingly, circulating CXCR5+CD4+ T cells appear to be composed of Th1-, Th2-, and Th17-like subsets that produce IFN-γ, IL-4, and IL-17, respectively (50). In FL patients, IL-4–producing CD4+ T cells recruited from the peripheral blood into the FL tumor microenvironment may be predominantly Th2-like CXCR5+CD4+ TFH precursor cells that may transform into IL-4–producing TFH cells after migration into the lymph node. IL-4 may also be produced by Vδ1 T lymphocytes in the tumor microenvironment; IL-4–producing Vδ1 T lymphocytes were shown to be increased in number in the peripheral blood in patients with FL, mantle cell lymphoma, and marginal-zone lymphoma when compared with healthy donors, and Vδ1 T lymphocytes were detectable in these tumors (51). Our results and these reports indicate that increased IL-4 in the FL tumor microenvironment is due to TFH cells, with a possible additional contribution from Vδ1 T cells. In Hodgkin’s lymphoma, in contrast, IL-13 is the cytokine predominantly responsible for STAT6 activation and CCL17 production (38, 52). In our studies, IL-13 was not hyperexpressed in FL tissues compared with reactive tonsils and had minimal or no effect on the production of CCL17 and CCL22 (data not shown). Our results suggest that chemokine-driven active recruitment of Tregs is one reason for their increased number in the FL tumor microenvironment. However, Tregs can be induced from conventional T cells by tumor cells in BCLs (26, 29). Therefore, development of therapeutic approaches that inhibit both the recruitment and induction of Tregs may be necessary to decrease the number of Tregs in the tumor microenvironment. In light of the differential expression of CCR4 on Tregs (46) and non-Tregs (Fig. 10C), and the knowledge that CCR4 is the only known receptor for CCL17 and CCL22, our data support the development of blocking Abs or small-molecule antagonists against CCR4 (53, 54) that can be used in combination with other immunotherapeutic strategies in therapies for FL and other B cell malignancies. Such agents are likely to inhibit the recruitment of immunosuppressive Tregs, as well as tumor-promoting, IL-4–producing T cells, and shift the balance in favor of antitumor immunity mediated by Th1 and T cytotoxic cell 1 cells in the tumor microenvironment, thereby enhancing the efficacy of therapeutic vaccines (16, 17) and other immunomodulatory drugs. Although intratumoral Tregs have been shown to be immunosuppressive by in vitro studies, there is uncertainty regarding the benefit of Treg reduction therapy because increased numbers of Foxp3+ cells in FL tumors have been associated with improved survival in FL (24, 55). However, Farinha et al. (25) observed that only the architectural pattern of Foxp3+ cells within FL tumors, rather than their number, influenced outcome; specifically, an intrafollicular localization pattern of Tregs correlated with decreased survival. This suggests the presence of distinct Treg subsets within the FL tumor microenvironment, and recent studies in basic immunology have shown that Tregs may differentiate into distinct subsets, based on various cues from their microenvironment, to regulate distinct effector cells such as Th1, Th2, Th17, and TFH (56–60). In FL, Tregs are present in both follicular and interfollicular regions, potentially representing distinct subsets (25). Tregs that localize to intrafollicular regions (follicular Tregs) in normal lymphoid tissues express high levels of CXCR5 and Bcl6 similar to TFH and were shown to be responsible for regulating germinal center reactions (59, 60). Indeed, follicular regulatory cells were recently demonstrated to be present in FL tissues (45). Whether other Treg subsets exist in FL tumors and whether CCL17 and CCL22 expressed by tumor cells have differential effects on recruitment of different Treg subsets needs to be studied in the future. In summary, our results provide novel insights into the interactions between TFH, tumor cells, and Tregs in FL. We showed that intratumoral TFH induce production of CCL17 and CCL22 by tumor cells via two distinct mechanisms involving IL-4 and CD40L. Overexpression of CCL17 and CCL22 in the tumor microenvironment induces preferential recruitment of Tregs and IL-4–producing T cells that, in turn, may stimulate more chemokine production, thus creating a vicious cycle and an immunosuppressive tumor microenvironment that promotes immune evasion and tumor survival and growth. Therapeutic strategies that interrupt this cycle may lead to inhibition of FL tumor growth by depleting survival and growth factors provided by the IL-4 and CD40L expressed by TFH. Furthermore, they may alter the tumor microenvironment by skewing the balance from immunosuppression to antitumor immunity, thereby enhancing the efficacy of both naturally induced and therapeutically induced antitumor immune responses and leading to improved clinical outcomes in patients with FL and possibly other B cell malignancies. We thank Kristi M. Speights for editorial assistance. This work was supported by the Doris Duke Charitable Foundation (S.S.N. ), National Institutes of Health Grant R01 CA155143 (to S.S.N. and R.E.D. ), Lymphoma Specialized Programs of Research Excellence (SPORE) Developmental Research Program (S.S.N. and R.E.D. ), The University of Texas MD Anderson Cancer Center Institutional Research Grant (to S.S.N. ), and Leukemia and Lymphoma Society Specialized Center of Research Grant 7262-08 (to C.D.). The University of Texas MD Anderson Cancer Center Lymphoma Tissue Bank is supported by the National Institutes of Health Lymphoma SPORE Grant P50CA136411 and the Fredrick B. Hagemeister Research Fund. The Flow Cytometry Core Facility is supported by The University of Texas MD Anderson Cancer Center Support Grant CA16672 from the National Institutes of Health. 1997. A clinical evaluation of the International Lymphoma Study Group classification of non-Hodgkin’s lymphoma. The Non-Hodgkin’s Lymphoma Classification Project. Blood 89: 3909–3918.
. 1985. Involvement of the bcl-2 gene in human follicular lymphoma. Science 228: 1440–1443.
. 2008. Age-dependent prevalence and frequency of circulating t(14;18)-positive cells in the peripheral blood of healthy individuals. J. Natl. Cancer Inst. Monogr. 2008: 44–47.
. 1996. BCL-2/JH rearrangements in circulating B cells of healthy blood donors and patients with nonmalignant diseases. J. Clin. Oncol. 14: 1333–1344.
. 1991. Progression from lymphoid hyperplasia to high-grade malignant lymphoma in mice transgenic for the t(14; 18). Nature 349: 254–256.
. 2008. IL-4 protein expression and basal activation of Erk in vivo in follicular lymphoma. Blood 112: 3818–3826.
. 2010. Follicular lymphoma cell niche: identification of a preeminent IL-4-dependent T(FH)-B cell axis. Leukemia 24: 2080–2089.
. 2012. Characterization of intratumoral follicular helper T cells in follicular lymphoma: role in the survival of malignant B cells. Leukemia 26: 1053–1063.
. 1997. In vitro activation of low-grade non-Hodgkin’s lymphoma by murine fibroblasts, IL-4, anti-CD40 antibodies and the soluble CD40 ligand. Leukemia 11: 1862–1867.
. 1997. T-cell derived cytokines co-stimulate proliferation of CD40-activated germinal centre as well as follicular lymphoma cells. Hematol. Oncol. 15: 197–207.
. 1984. The natural history of initially untreated low-grade non-Hodgkin’s lymphomas. N. Engl. J. Med. 311: 1471–1475.
. 1997. Autologous tumor infiltrating T cells cytotoxic for follicular lymphoma cells can be expanded in vitro. Blood 89: 3806–3816.
. 2008. A novel strategy for rapid and efficient isolation of human tumor-specific CD4(+) and CD8(+) T-cell clones. J. Immunol. Methods 331: 13–26.
. 2004. Prediction of survival in follicular lymphoma based on molecular features of tumor-infiltrating immune cells. N. Engl. J. Med. 351: 2159–2169.
. 1999. Complete molecular remissions induced by patient-specific vaccination plus granulocyte-monocyte colony-stimulating factor against lymphoma. Nat. Med. 5: 1171–1177.
. 2004. Human autologous tumor-specific T-cell responses induced by liposomal delivery of a lymphoma antigen. Clin. Cancer Res. 10: 8309–8317.
. 1998. Rituximab chimeric anti-CD20 monoclonal antibody therapy for relapsed indolent lymphoma: half of patients respond to a four-dose treatment program. J. Clin. Oncol. 16: 2825–2833.
. 2005. Rituximab therapy for patients with newly diagnosed, advanced-stage, follicular grade I non-Hodgkin’s lymphoma: a phase II trial in the North Central Cancer Treatment Group. J. Clin. Oncol. 23: 1103–1108.
. 2008. Eight-year experience with allogeneic stem cell transplantation for relapsed follicular lymphoma after nonmyeloablative conditioning with fludarabine, cyclophosphamide, and rituximab. Blood 111: 5530–5536.
. 2006. Intratumoral CD4+CD25+ regulatory T-cell-mediated suppression of infiltrating CD4+ T cells in B-cell non-Hodgkin lymphoma. Blood 107: 3639–3646.
. 2006. High numbers of tumor-infiltrating FOXP3-positive regulatory T cells are associated with improved overall survival in follicular lymphoma. Blood 108: 2957–2964.
. 2010. The architectural pattern of FOXP3-positive T cells in follicular lymphoma is an independent predictor of survival and histologic transformation. Blood 115: 289–295.
. 2008. Local and systemic induction of CD4+CD25+ regulatory T-cell population by non-Hodgkin lymphoma. Blood 111: 5359–5370.
. 2006. Attenuation of CD8(+) T-cell function by CD4(+)CD25(+) regulatory T cells in B-cell non-Hodgkin’s lymphoma. Cancer Res. 66: 10145–10152.
. 2007. Follicular lymphoma intratumoral CD4+CD25+GITR+ regulatory T cells potently suppress CD3/CD28-costimulated autologous and allogeneic CD8+CD25- and CD4+CD25- T cells. J. Immunol. 178: 4051–4061.
. 2007. CD70+ non-Hodgkin lymphoma B cells induce Foxp3 expression and regulatory function in intratumoral CD4+CD25 T cells. Blood 110: 2537–2544.
. 2009. Follicular lymphoma B cells induce the conversion of conventional CD4+ T cells to T-regulatory cells. Int. J. Cancer 124: 239–244.
. 2006. Thymus and activation regulated chemokine (TARC)/CCL17 and skin diseases. J. Dermatol. Sci. 43: 75–84.
. 2000. Macrophage-derived chemokine (MDC). J. Leukoc. Biol. 68: 400–404.
. 2003. Identification of Hodgkin and Reed-Sternberg cell-specific genes by gene expression profiling. J. Clin. Invest. 111: 529–537.
. 2011. Vaccination with patient-specific tumor-derived antigen in first remission improves disease-free survival in follicular lymphoma. J. Clin. Oncol. 29: 2787–2794.
. 2011. Clinical impact of different classes of infiltrating T cytotoxic and helper cells (Th1, th2, treg, th17) in patients with colorectal cancer. Cancer Res. 71: 1263–1271.
. 2001. Detection of keyhole limpet hemocyanin (KLH)-specific immune responses by intracellular cytokine assay in patients vaccinated with idiotype-KLH vaccine. J. Cancer Res. Clin. Oncol. 127(Suppl. 2): R14–R19.
. 2008. Vorinostat inhibits STAT6-mediated TH2 cytokine and TARC production and induces cell death in Hodgkin lymphoma cell lines. Blood 112: 1424–1433.
. 2004. Follicular lymphoma international prognostic index. Blood 104: 1258–1265.
. 2007. Manipulation of signaling to control allergic inflammation. Curr. Opin. Allergy Clin. Immunol. 7: 51–56.
. 2006. Signaling mechanisms, interaction partners, and target genes of STAT6. Cytokine Growth Factor Rev. 17: 173–188.
. 2006. Interleukin-4 induction of the CC chemokine TARC (CCL17) in murine macrophages is mediated by multiple STAT6 sites in the TARC gene promoter. BMC Mol. Biol. 7: 45.
. 2001. Chemoattractants MDC and TARC are secreted by malignant B-cell precursors following CD40 ligation and support the migration of leukemia-specific T cells. Blood 98: 533–540.
. 2003. TARC and MDC are produced by CD40 activated human B cells and are elevated in the sera of infantile atopic dermatitis patients. J. Med. Dent. Sci. 50: 27–33.
. 2001. Unique chemotactic response profile and specific expression of chemokine receptors CCR4 and CCR8 by CD4(+)CD25(+) regulatory T cells. J. Exp. Med. 194: 847–853.
. 2010. The elusive identity of T follicular helper cells. Trends Immunol. 31: 377–383.
. 2011. Human blood CXCR5(+)CD4(+) T cells are counterparts of T follicular cells and contain specific subsets that differentially support antibody secretion. Immunity 34: 108–121.
. 2007. Expansion of Vdelta1 T lymphocytes producing IL-4 in low-grade non-Hodgkin lymphomas expressing UL-16-binding proteins. Blood 109: 2078–2085.
. 2002. The role of interleukin 13 in classical Hodgkin lymphoma. Leuk. Lymphoma 43: 1203–1210.
. 2006. CCR4 as a novel molecular target for immunotherapy of cancer. Cancer Sci. 97: 1139–1146.
. 2008. In silico identified CCR4 antagonists target regulatory T cells and exert adjuvant activity in vaccination. Proc. Natl. Acad. Sci. USA 105: 10221–10226.
. 2006. Immunohistochemical patterns of reactive microenvironment are associated with clinicobiologic behavior in follicular lymphoma patients. J. Clin. Oncol. 24: 5350–5357.